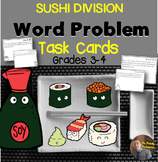 Recipe for Reading Comprehension - "Sushi"
Also included in: MENU MATH -17 Item Mega BUNDLE! 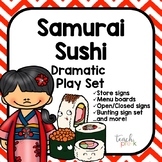 Also included in: Dramatic Play Restaraunt Bundle! 4 Different Restaurants!! 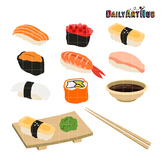 This is a set of sushi and Japanese Food clip art. There are 10 color and 10 black and white images included. 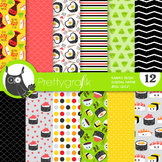 The 300 dpi .png images are contained in a .zip file and have transparent backgrounds. Personal and Commercial Use is fine! 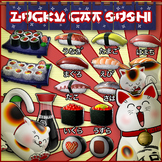 Help Silly Sushi Chef Seiya and Silly Sushi Chef Saki package sushi orders to go by telling them how many more they need to make ten. 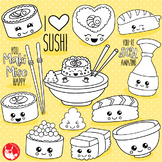 These two fun worksheets teach them math and a little about the culture of Japan. 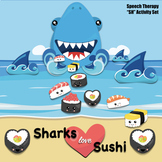 Sharks Love Sushi - Articulation Activity for "SH"
East Side Sushi Movie Guide. Guía de Preguntas. Japanese Mexican Cuisine. 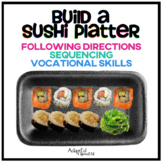 This is an easy introductory recipe for students with special needs specifically Autism. 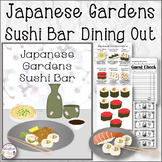 The recipe includes visuals for each step, cooking tips, and kitchen tools needed. Teach your students to follow instructions and directions while working on visual memory, visual discrimination, sequencing and motor planning at the same time! This set works on so many skills at once! Often times our students with special needs have a difficult time following verbal directions. 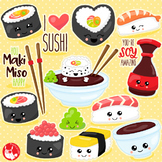 Sushi Clip Art - Great for Art Class Projects!